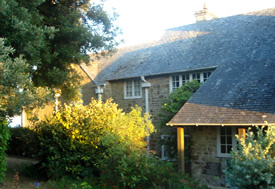 Lamledra sleeps up to 19 people in 10 bedrooms, 7 in the main house and 3 in the annexe. The bedrooms comprise: 2 doubles, 5 twins, 2 singles, and one 4-bed room, all with duvets and blankets. 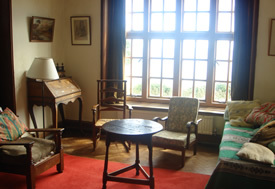 The bedrooms are furnished in a simple style and most have sea views. The main house has a kitchen with integrated eating area, a dining room with a woodburning stove, a sitting room with open coal fireplace and a playroom with table tennis, piano and a woodburning stove. There is one bathroom, two shower rooms, a washing area, three toilets and a utility area with washing machine, dryer and freezer. 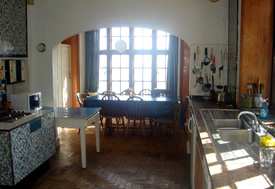 The main house has oil-fired central heating and the annexe has electric heaters. Wifi is available. Lamledra is available for renting throughout the year, generally Saturday to Saturday, but availability is limited in the main school holidays. We also rent for weekends and shorter periods during the winter months November - February. Weekly rental ranges from £800-£3300 exclusive of utility costs incurred (oil, electricity etc). Short winter lets range from £500 - £600. 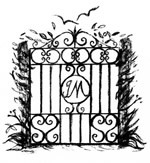 An optional linen service is available at an extra charge. Cleaning is included in the rent. A 33% non-returnable deposit is required at the time of booking. The full rent is payable 3 months in advance. Information on availability and further details on prices can be supplied on request. 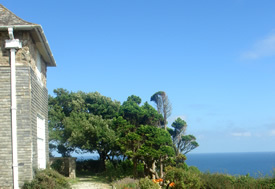 The house, built in 1911 and extended in the 1920s, sits directly above the Vault Beach, with its sands, cliffs and rocks. A path to the beach goes through the field which surrounds the house and is also good for ball games etc. The house has many original period features and a Petrov upright piano which is regularly maintained. Facilities are simple but adequate. It is especially suitable for large or multi-family holidays and gatherings; art, music, study and writing groups; yoga and meditation retreats; and we welcome smaller parties too. Detailed information about the vicinity, walks and local tourist attractions is provided in the large collection of brochures, guides and maps available in the house. 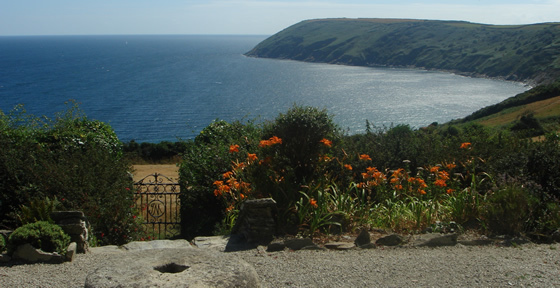 The terrace and garden overlooking the sea are directly accessible from the house. Lamledra House is approached along a short track from the road, and there is ample car-parking space. The house has assisted wheelchair access to the whole of the ground floor, where there is a twin bedroom, bathroom and toilet. Tenants are charged for utilities – electricity, oil, coal and wood. Bed linen can be provided at an optional extra charge, although many people prefer to bring their own. A full information sheet about using the house is available. The caretaker lives nearby, greets all tenants on arrival and is available for help and advice. The house is cleaned at the end of each stay. Dogs are permitted, after discussion with the owners.